The storage of flammable materials are common at most work sites, either in liquid, gas or solid forms. See below for examples of each form of flammable material. Storage of flammable materials are present in many workplaces – remain compliant with a flammable storage building by US Chemical Storage. Liquids – A flammable liquid, defined by the NFPA, “is a liquid whose flash point does not exceed 100°F, when tested by closed-cup test methods…”. Examples of flammable liquid materials include gasoline, solvents, pentane, acetone, benzene, diethyl ether, ethanol and cyclohexane. Read our article on the Storage of Flammable Liquids to learn more about hazard classifications for flammables and combustibles. Gases – Examples of flammable gases include natural gas, compressed gas, butane, methane, carbon monoxide, and aerosols. There are two categories of flammable gases including category 1 and category 2. Category 1 includes gases that have a lower explosive limit of 13 percent or less by volume in air, or contain a flammable range of at least 12 percent. All other flammable gases fall under category 2. Solids – Flammable solid materials include pyrophoric metals, solid wastes that have been soaked with flammable liquids and other materials including gunpowder and coal. Flammable material storage should be fully contained in a compliant flammable storage building or cabinet, depending on the volume of materials being stored. To ensure safe storage of flammable materials, have Material Safety Data Sheets (MSDS) on hand for each type of chemical. Avoid storing hazardous materials near entry or exit ways. Flammable and non-flammable materials should be stored away from direct sunlight and ignition sources including heat and electrical equipment. Before transferring flammable materials inspect each container for rust, dents or other signs of physical damage. Ensure each container is grounded with grounding wires to eliminate any electrostatic discharge that may occur during the transfer process. After grounding connections are made, touch the ground to discharge yourself prior to handling each container. 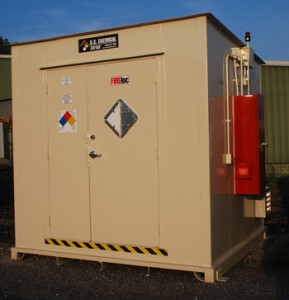 Contact US Chemical Storage online or call 888-294-2729 to find out more about flammable storage buildings and how to safely store flammable and combustible materials.